It is a small shop, cluttered with pieces of wood, guitars of many types and in various stages of disrepair and repair, and photographs of Sabicas, the Romeros and other friends decorate the wall. 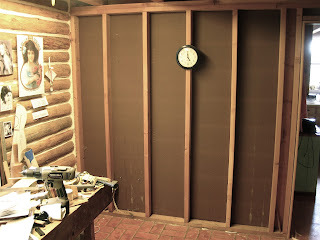 Today, I started pulling down the old wall paneling in my studio. I plan on replacing it with tongue and groove paneling made from aspen. The original paneling was made to look like pine, but the owners previous to use had painted it white which made the paneling even more ugly. Here is a before photo. My life is one big clutter. Here is what the wall looked like at 5pm this afternoon. The room behind the exposed studs is our bathroom, which is the next project to be done in the house. My wife and I want to house to be ours and to reflect the tastes of the original owners, Colonel Reginald Barnsley and his wife, Jeanette. The rest of the house is paneled with pine and the faux pine paneling sheets. 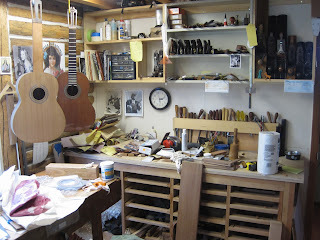 And I am going to put amber shellac on the aspen to make it match the pine. Once I finish the paneling I am having a plumber install plumbing for a washing machine and have an electrician wire in a 220v outlet for a dryer. I am tired of driving to the laundromat in Estes Park to do our laundry. 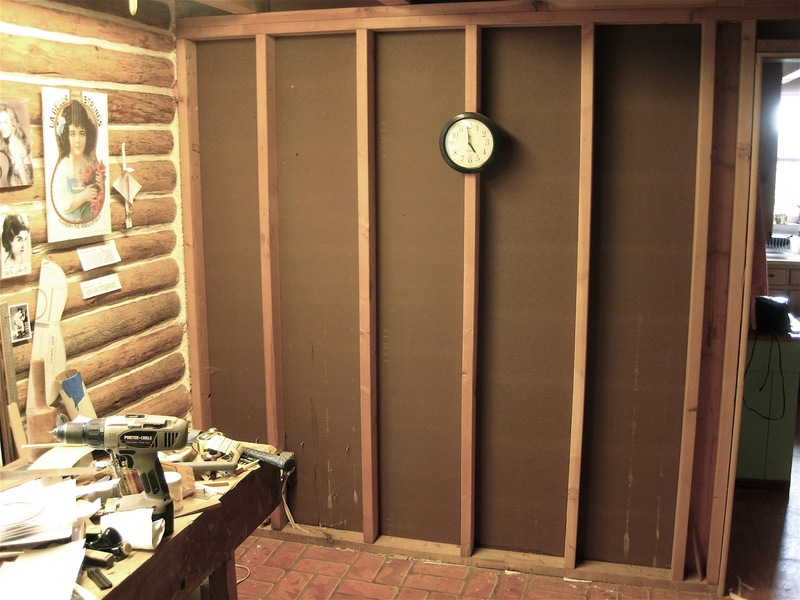 I plan on converting the current woodshed/storage shed into a studio this fall and winter. It will give me a whooping 280 square feet of room to do my work.